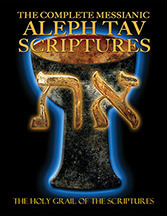 Book size = 8.5" x 11"
The Complete Messianic Aleph Tav Scriptures (C-MATS) is a study bible which focuses on the study of the Aleph/Tav Character Symbol used throughout the old testament (Tanakh) by both Moses and the Prophets and is the most exhaustive and unique rendition of its kind in the world. Over 5 years in the making, this English rendition reveals every place the Hebrew Aleph Tav symbol was used as a "free standing" character symbol believed to express the "strength of the covenant" in its original meaning. The Aleph/Tav was also believed to be the "mark" of the "divine hand" for thousands of years by such famous rabbis as Nahum of Gimzo, Akiva, and R. S. Hirsch as well as the Apostle John who claimed in the book of Revelation that the symbol also incorporated Y'shua haMashiach (Jesus the Messiah) because of His divinity. Also revealed in C-MATS is the use of the Aleph/Tav as it is incorporated into the creation of hundreds of Hebrew words used thousands of times, thus taking our understanding of the scriptures to a whole new level. C-MATS comes in your choice of either Paleo or Modern Hebrew, Large Print 8.5x11 editions and include the New Testament. William H. Sanford is a licensed minister and has been studying and teaching the gospel message for over 40 years. William has over a dozen short videos about The Messianic Aleph Tav Scriptures (MATS) on YouTube. Book size = 8.5"x 11"
or for shipments outside the United States, please contact us. Orders are shipped via UPS courier which includes insurance & tracking.